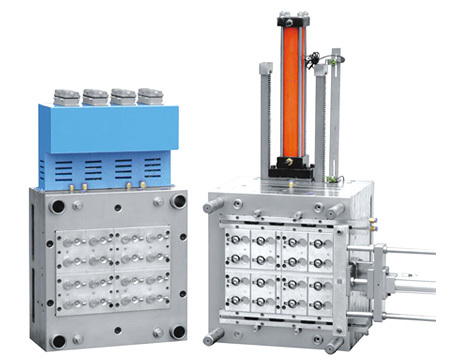 ◎Preform injection mould from 1 cavity for wide mouth jar and gallon bottle preform up to 72 cavities narrow neck. ◎Tube blank is designed with the help of computer,which surely contributes to the increasing of yield of bottle. ◎Employes′intemationally advanced two-step dual taper locating technology,Each cavity self-locks independently to ensure low decent ration of product. ◎Core and cavity are made of special mould steel after preheating treatment in the onginal factory in Sweden.individual temperature control of all cavities. ◎Lip cavity is made of imported nitrated steel,which is of high hardness and long service life,in accordance with intemational Standard. ◎The excellent hot runner design assures uniform heating and greatly improves the quality of plastic product. ◎No cutting of gate is employed to reduce the labor intensity;Standard inter-changeable mould components. ◎The life of mould is more than 2 million times. ◎We are deeply recognizes that the only way for a company's endeavors to perpetuate,depending on continuous improvement and innovation,reaching market requirements,and providing competitive products for our customers.Just like our principles reveal:"Customer Satisfaction,Colleague Delight,Endeavor Perpetuity〃.